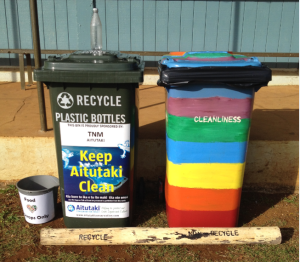 The Araura College Enviro Squad was set up in late April 2015 to develop an environmental project to reduce waste and protect Aitutaki’s land and lagoon by promoting the 3Rs – Reduce, reuse recycle. Traditionally, Aitutakians are very connected with the land and lagoon, which are a major part of people’s life and livelihoods and have economic, environmental, social and cultural values. The aim is to influence behavioural change so that the environment is intrinsic in every choice and decision. The long term objective is to apply the approach of the Enviro Squad Project to other schools in Aitutaki and potentially the Cook Islands. The goal is to become the Cook Islands first Enviro School, a status that is recognised in New Zealand and we hope one day will be recognised here in the Cook Islands also. Recycle – separate all rubbish into plastics, glass, aluminium, food scraps, paper and non-recyclables into correct bins. Reduce – eliminate school vendor use of styrofoam containers (largest proportion of school rubbish by volume) and switch to use of biodegrable containers, reduce general rubbish generated by the school. Reuse – set up a worm farm and composting in the school, make reused paper pads. Stop – school landfill and burning of rubbish. Organic gardening club – teach students about sustainable planting and composting methods. Education & raising awareness: Educate on traditional/cultural relationship with the environment and use of notice boards, competitions, presentations to school, newsletter, media releases, Facebook page to communicate progress and raise awareness. Do you love it enough? Kia Ma!